Boss Tower, a modern new office and residential premises offering all the essential facilities for convenience and comfort. Boss Tower consists of two interconnected sections, one low-rise building of luxurious offices and another high-rise building of furnished apartments. IN THE HEART OF THE CITY, where the great demand for offices and residential buildings is increasing everyday, the 23 storey buildings offering rental of offices and furnished apartments is strategically located in the central business districts, entertainment places, hospitals, and government offices. 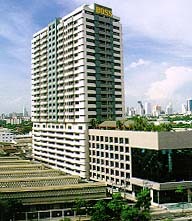 Boss Tower also provides an easy access to Bangkok's principal city roads: Sukhumvit, Klong Toey, Asoke and Ekamai. Its proximity to expressway entrances and exits means that all parts of Bangkok are in easy reach. 150 residences' fittings and furnishings are tastefully decorated and thoughtfully placed to give you breathing space. A fully-equipped kitchen in each residence gives you the option for a night of dining pleasure with close friends and family within the comfort of your well-appointed residence. Friendly faces and warm smiles greet you whenever you are at Omni Tower, Bangkok. As our guest, your needs are well anticipated and served. For all queries and assistance in all matters, don’t hesitate to call on our 24-hour guest services. For recreation, Omni Tower offers a suitable range of facilities; refresh yourself with a swim in the pool or turn a full workout in the fully equipped gymnasium and aerobics room. Relax at the sauna or hang out with friends and the expatriates at the snooker room. At Omni Tower, Bangkok, the choice is yours for the making.